A comparative tasting could be seen as an act of folly, when one of the participants is a world famous wine from Burgundy, and the other is a generally modest white wine from Tuscany, a region with a far greater reputation for its red. Yet the idea for the tasting came from the latter camp: the underdog producers of Tuscany’s Vernaccia di San Gimignano. 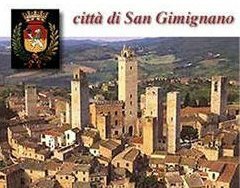 San Gimignano has recently realised that its Vernaccia does have an ability to age. Previously it had always been considered a wine for early drinking, within a couple of years, but recent tastings of some older bottles have proved otherwise. So on a chilly Monday morning a group of us gathered in the magnificent Sala Dante in the Palazzo del Podestà in the centre of the hilltop town of San Gimignano. This is where Dante came as ambassador from Florence in 1300 to persuade the people of San Gimignano to join the league of the Guelfs against the Ghibellines. The walls are covered with frescos from the 12th and 13th centuries, and if the wines had failed to inspire, there were duelling knights on horseback, with colourful coats of arms on their shields, to admire instead. But the wines were compelling. First, it was made quite clear that Vernaccia was not aspiring to be Chablis; this was a friendly meeting of wines, with six examples from each region, three from recent vintages, and three more mature wines. We began with the 2004 vintage, with Tenuta Mormoraia compared to a Domaine Laroche 1er Cru Fourchaume Vieilles Vignes. The Vernaccia was rich, almost honeyed, with a firm streak of acidity. The Fourchaume too had a honeyed note with a firm backbone of minerality. Then we moved on to the 2003 vintage, which was represented by Fattoria Abbazia di Monteoliveto ‘la Gentilesca’, and Domaine William Fèvre Vaulorent 1er Cru. 2003 is remembered in Chablis as the year of the heat wave and the vintage is atypical for its lack of acidity, so that the Vaulorent was softer and richer than you would normally expect. In Tuscany too, 2003 was a hot vintage, and this Vernaccia was full-bodied and rich. A proportion of it had been aged in oak barrels, as had the Chablis, so that the vinification methods were comparable.Next came I Campi Santi from San Quirico, a 2001 riserva, which was set against Domaine Raveneau Chapelot 1er Cru 2002. Raveneau is an estate that consistently features amongst the great names of Chablis, so you might have expected the Vernaccia to have been overwhelmed. But San Quirico more than adequately held its own. I Campi Santi is the result of a strict selection of grapes from twenty years old vines and the wine is kept for eighteen months in vat before bottling. It displayed an elegant minerality with leafy notes and a certain body and weight, while the Chapelot was richer with a honeyed minerality and layers of flavour. And then we moved on to more mature bottles. It was a pity that all the older examples of Vernaccia came from just one producer, Giovanni Panizzi. That is not to criticise the wines, but there are other producers in San Gimignano who could have contributed comparable bottles, such as the barrel fermented Carato from Montenidoli or the 1997 riserva from La Lastra, tasted later in the day, with rich leafy fruit and lingering notes of maturity. However there is no doubt that Signor Panizzi’s riservas more than held their own. The first vintage was 1999, represented by Domaine William Fèvre Chablis Grand Cru Les Clos. This was everything that Chablis’ finest grand cru should be, with rich fruit on the nose and palate and layers of flavour. It was still very youthful. Curiously the 1999 Panizzi, which was aged in barrel for twelve months, had some of the notes of undergrowth, or sous-bois, that you can often find in mature Chablis. 1995 was the next vintage, which was good in both Tuscany and Chablis and was represented in Raveneau Chablis Grand Cru Valmur. The Panizzi wine was rich and honeyed on the palate, again with notes of sous-bois on the nose, and on the palate it was rich and complex, with a touch of botrytis. The Valmur has hints of beeswax, another characteristic of maturing Chablis, with honeyed notes and a firm minerality and acidity, with layers of flavour. The comparison was fascinating; the two wines were different but neither dwarfed the other. The 1990 vintage in Chablis was the Domaine Laroche Grand Cru Blanchots. Here I have to admit a feeling of disappointment. The bottle I tasted was more mature than I would have expected, with hints of premature oxidation, while the Panizzi had aged beautifully, even though, unlike the previous two wines, it had not been aged in oak. It had a delicate leafy note on the nose, with firm acidity and rounded notes of maturity on the palate. You may well ask what we learnt from all this. I am not sure; for me the experience was a pleasure as Chablis is my favourite white wine so I never tire of tasting it. And I was intrigued by the unexpected longevity and depth of the mature Vernaccia. The comparison could have been considered foolhardy and was certainly brave, but there was no doubt that the Vernaccia acquitted itself with valour. Maybe it was the visiting Chablisiens who were taken unawares. As Jean-Marie Raveneau observed, he was quite surprised by the ageing ability of Vernaccia, which as in Chablis, comes from its firm backbone of acidity. And there is another similarity; as in Chablis, you can also find oyster shells in the vineyards of San Gimignano. So it seemed entirely appropriate at the end of the day to enjoy Vernaccia and oysters as guests of Palagetto, a new estate in San Gimignano, with a rising reputation. One thing is for sure: the combination was as satisfying as if it had been Chablis.